"Bulger insists that the FBI didn't use him, he used the FBI." Whitey Bulger already began building his reputation as Southie’s most notorious gangster when an opportunity arose allowing him even more control. FBI agent, John Connolly, offered Bulger a position as an informant for the FBI. Since they grew up together in the same housing projects in South Boston, Whitey did not refuse. John Connolly - I did numerous interviews with him and he talked about how people complained how you shouldn’t have the hometown agent in charge of the hometown gangster. But, he was saying that he was the only one that could have gotten information out of Whitey." The video clip above explains Whitey's relationship with the FBI. As an informant, Bulger provided the FBI underground secrets regarding the war on organized crime, referring to the Italian Mafia, La Cosa Nostra. Offering Whitey this position was a strategy by the FBI to take down this group which “ran the most dangerous of racketeering enterprises” (Lehr, Murphy 1). However, Whitey’s wit and manipulation skills gave him the upper hand until his arrest in 2011. In the war declared against La Cosa Nostra, the patriotic Bulger became a soldier. But he followed his own orders. Protected, warned, enabled, and abetted, he rose while others were killed or arrested and imprisoned. Accomplished in the arts of deceit, manipulation, and corruption, he used agents to turn the Federal Bureau of Investigation into the Bulger Bureau of Investigation." Connolly conveniently left out of his report that Whitey had instructed him and John Morris to tell Barrett that Whitey was looking for him and wanted a cut, and that he could save himself by joining the Witness Protection Program and giving up all the crooked cops who had helped him rob the bank.This marked a new dimension in the conspiratorial bond between Whitey and the FBI. Now it was the mobster telling agents how to cultivate informants and who to go after. Connolly and Morris dutifully carried out Whitey's plan." Whitey used his relationship with the FBI to warn fellow associates of indictments - illustrating his loyalty to fellow “thugs.” However, in this game of sharing secrets to protect himself, James Bulger was not completely loyal. In fact, it was when he leaked that Connolly was a gangster as well despite their close relationship, that solidified Whitey’s power as more dangerous than the Mafia's. Looking back, one thing is certain: The deal struck in 1975 proved to be career-enhancing for the two principles. 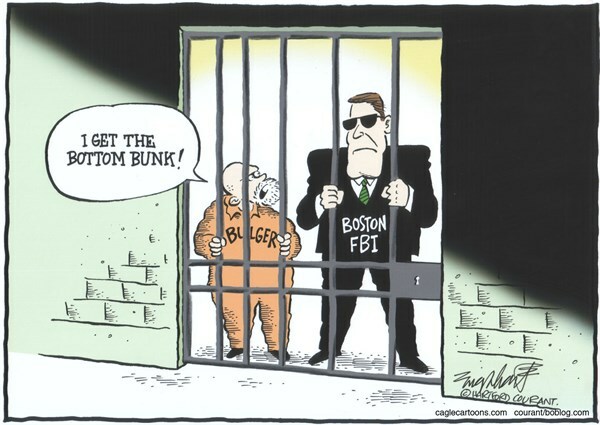 Connolly rode Bulger to star status in the Boston office as a valued handler of top-echelon informants, and Bulger rode his ties to the FBI to enormous underworld power and riches."